If you have multiple individual sheets within your Excel workbook, when you try to create a PDF and choose to print the Entire Workbook, each sheet will be saved as a different PDF file. This happens because one (or multiple) sheets in your workbook have a different dpi setting for printing. Because of this, Excel assumes that each individual sheet has to be sent for printing separately, so it will send it in the same way to the PDF printer which will prompt to create a PDF from each sheet. In order to have all the individual sheets printed within a single PDF file (not multiple PDFs) you need to set the same DPI printing value for all of them. novaPDF will ask you where to save the PDF and (if set so) it will open the PDF when it's created. You will have to repeat these steps for each individual sheet in your workbook. The above method is recommended when you have different printing settings for each page (for instance if you have a Header/Footer set for each page). However, if you have the same printing settings for each sheet in the workbook, you can change the Page Setup options for all sheets at once. Please note that by using this method you will have the same settings for all sheets, including the header/footer. In Microsoft Excel 2016/2013/2010/2007 go to Page Layout and click on the expand button for the Page Setup dialog (for Microsoft Excel 2003 or earlier go to File->Page Setup). Set the Print Quality to the DPI value you want and press OK so that Excel will record the fact that all pages have the same print settings. It's important to press the OK button even if you don't change anything, because this will "tell" Excel that all the sheets have the same page setup options. Click on File then Print and see if you like the way the pages will show when printed to PDF. If you don't have any changes to the printing options select the Print Entire Workbook option under Settings and novaPDF from the Printer name section and click Print to create the PDF file. novaPDF will ask you where to save the PDF and (if set so) it will open the PDF when it's created. 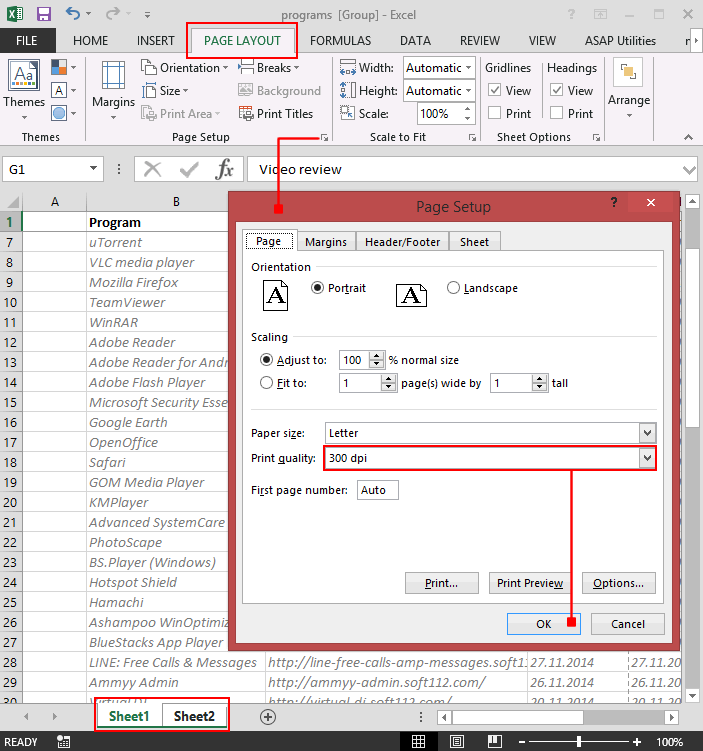 novaPDF includes a PDF merging (combining) option, so another way to have multiple individual Excel sheets printed to a single PDF would be to use novaPDF's own merge option. This will let you print the first sheet to a PDF document and after that print all the other sheets in that workbook to the same pdf.